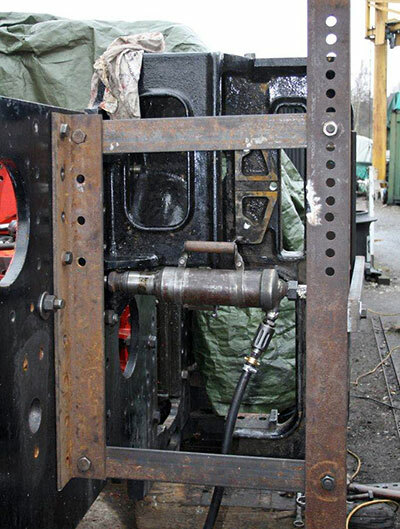 Riveting of the motion brackets through the frame plates into the vertical stretcher has begun and also riveting of the "St.Andrews" cross stretcher between the vertical stretcher and the smokebox saddle. Work has proceeded apace with only a few left to attend to at the time of writing. All the horn guides and the horn blocks are secured in position with temporary bolts whilst reaming of the holes to finished size proceeds. We have obtained the forged U shaped framework for the axlebox guides for the pony trucks although there is much to do to turn them into the finished component. The latest information on cylinders is that casting is hoped for in March/April. Look out early next month, in the next issue of SVR News, for a feature-length article by Paul Anderson about his experiences of working on the Riddles Class 3 tanks during his years (1963-1966) as a fireman at Nine Elms shed. Paul loved these locos and describes them as "lovely, snappy little engines that did all that was required of them and in addition were a doddle to prepare and dispose". The article will be accompanied by an appeal leaflet aimed at the wider membership of the SVR, so keep your fingers crossed for a good response. The Trust has roughly 5% of the SVR membership on board. Even allowing for apathy, dislike of new builds and the very legitimate rival claims of other Valley-based groups, we think it ought to be possible to double this figure. With this end in view, Chris had a cordial meeting at Bewdley early in the month with Clare Gibbard, the SVR's new(ish) Marketing Manager. The aim was to explore the ways in which the 82045 project can be further incorporated into the Railway's corporate marketing and publicity strategy. The SVR will have a valuable asset when 82045 enters service, not only because it will provide much-needed support to the operational fleet, but also through its very great earnings potential, both in attracting visitors to the line and also in terms of fees for hire to other heritage railways. As we stagger out of another long winter - which at the time of writing appears to be unwilling to let go! - the date for the 2013 Annual General Meeting draws rapidly closer. Don't forget that this will be held at the Kidderminster Railway Museum on Saturday 6th April at 2.00 p.m. Please try to attend - you don't have to be a member to come along, though we may try to recruit you on the day - and feel free to bring a friend with you. The AGM's up to now have been positive, upbeat affairs, and we hope to continue the tradition this year. The meeting will provide a forum for an exchange of views as well as informing you of plans for the next twelve months. Constructive comments are always welcome. The Museum is a pleasant venue, and the tea room downstairs does snacks and drinks, including excellent toasted sandwiches and a mean and very substantial bowl of chilli-con-carne or chunky home-made soup. 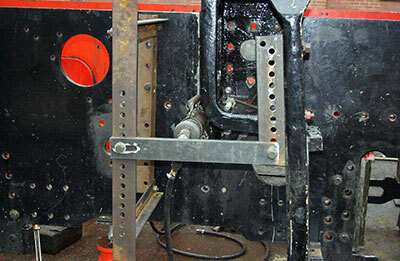 Two photos showing the rivet 'jammer' holding a rivet in place whilst the end is riveted over inside the mainframe plates. The motion bracket rivets are inserted from the outside hence the need for a support framework to jack against. 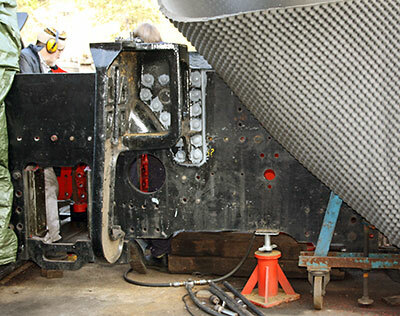 Most of the cold rivets in other areas are inserted from the inside the chassis for the end to be riveted over on the outside of the chassis. The driver's side motion bracket rivets in place.